The golden sun drifts across the Caribbean sky before it slowly lowers itself along the western horizon and ends its journey by sinking behind the shimmering ocean water. From the lovely Villa Sea Cliff, the stunning scene unfolds. At this St. Barths villa you can enjoy the unparalleled beauty of St. Barths in peace and privacy. Set in Pointe Milou, Villa Sea Cliff offers surreal views. Sea Cliff is wonderfully set-up for two families traveling together. This two-pavilion villa has two bedrooms located in each pavilion, so parents can be close to children, but each family can have complete privacy. With four bedrooms total, Sea Cliff can comfortably accommodate up to eights guests. Lounge by the mosaic-tiled infinity pool on the sun-soaked terrace, lapping up the golden Caribbean rays, or retreat from the St. Barths sun under the covered terrace area. Gorgeous gardens surround the tranquil scene with lush greenery spotted with delightful patches of colorful colors. 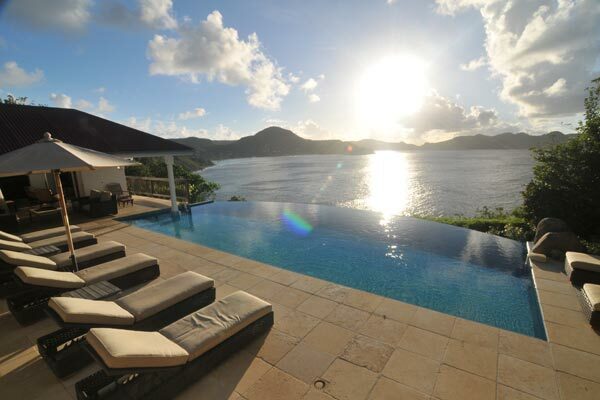 Enjoy perfect days at this deluxe villa, and allow yourself to relax completely on St. Barths. Walk down the path steps that lead you from Sea Cliff to the ocean and jump in for snorkeling just below your backdoor. Explore the world beneath the simmering water whenever you please right at the villa or pack a beach bag and picnic and enjoy the stunning white sand beaches of St. Barths.